The front occupied by General Rockey's 5th Division on the morning of 25 February formed a 1,200-yard bow. From advanced positions in the center, held by 2/26, the right flank curved back to the south where 3/26 and one company of 1/26 made contact with the 3d Division. On the left, 2/27 bent back a like distance to hold the cliff line near the western beaches. 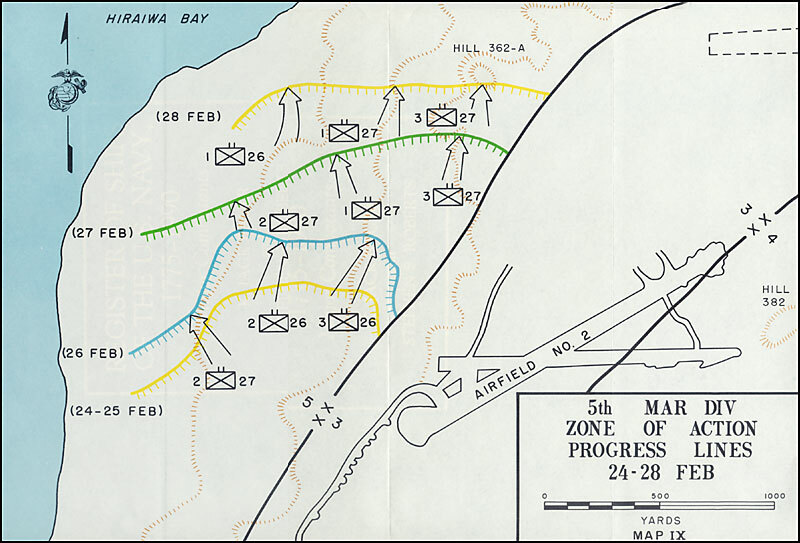 The action of the preceding days made it evident that high ground in the center of the island dominated the 5th Division zone of action, and that no considerable gains could be registered up the west side until the enemy had been cleared from the bluffs along the 3d Division's left boundary. 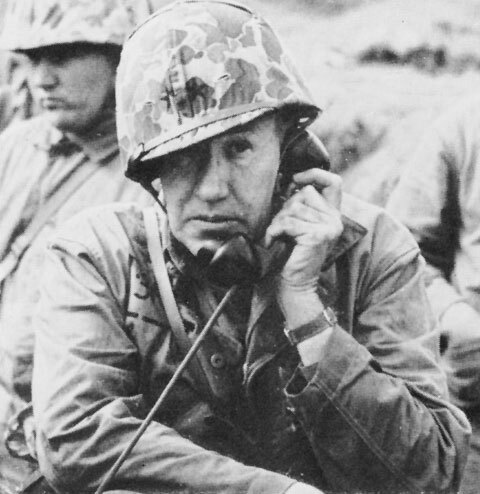 MAJOR GENERAL ROCKEY commanded the 5th Marine Division at Iwo Jima. night, and this shift on D-plus-6 (25 February) was the only attempt of this sort observed.4 The Marines' success must have convinced the enemy that it was folly to expose his equipment in daylight, especially with United States airborne observers over the island. On the right, Company A tanks supported 3/26 with overhead fire until rain and low-hanging clouds obscured targets, and that battalion gained about 100 yards. During this action the infantry smashed not only fortifications to the front, but knocked out many enemy guns emplaced in ravines that led down from the plateau, perpendicular to the route of advance. Enfilading fire from these hostile weapons had constituted a menacing thorn in the side to men of the 5th Division. But by D-plus-6 this opposition showed signs of diminishing as Marines push to the north. Gains by RCT 9 in the 3d Division sector, and weapons firing in support of that regiment also contributed to progress made in the 3d Battalion zone. During the night of 26/27 February there were indications that at least some of the defenders might be suffering from a shortage of water. Alert Marines of RCT 26 spotted a large group of enemy soldiers making its way over the cliff line south of Hill 362A toward a well near the coast. Illuminated by bright moonlight, this group made an excellent target; artillery and naval gunfire adjusted on it immediately, putting an abrupt end to this foraging expedition. With the exception of this incident the night was quiet along the division front. On D-plus-8 the 27th Marines relieved RCT 26 and attacked at 0800. The 1st and 3d Battalions passed through 2/26 and 3/26 respectively, while 2/27, which had reverted to parent control, continued to operate on the left. The 1st Battalion, 26th was attached to RCT 27 and held in regimental reserve. 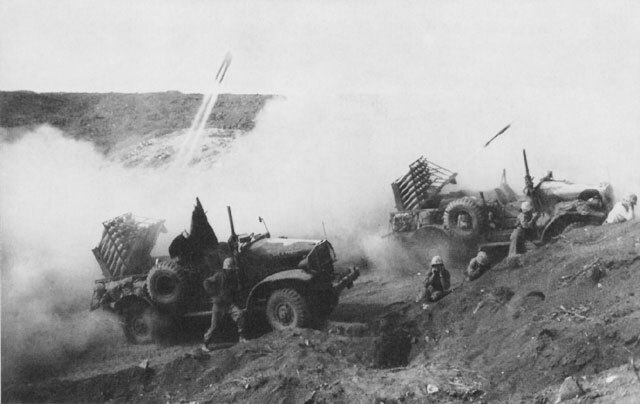 One battalion of corps artillery reinforced the fires of the 13th Marines during a 30-minute preparation, and naval guns concentrated on Hill 362A from K-minus 30 minutes to K-minus 15 minutes and again for five minutes immediately following K-Hour. Just before the infantry moved out, truck-mounted launchers from the 3d Rocket Detachment plastered the area to the front with a blistering barrage of 4.5-inch rockets, then withdrew quickly to the rear. After naval gunfire lifted from Hill 362A, carrier planes swept in to work over the same area with bombs and rockets. MACHINE-GUN UNIT takes cover from hostile rifle and mortar fire. With enemy holding high ground on the right, even movement behind the lines was hazardous. advance was rapid during the morning, but about noon contact was lost on the right and 3/27 was held up. The reserve company was committed to regain contact, but by this time enemy resistance had stiffened and only small gains marked the afternoon action. In the center the 1st Battalion jumped off against sporadic artillery and mortar fire, advancing 200 yards before a stubbornly resisting group of pillboxes stopped the attack. A 75mm halftrack came forward to help in the reduction of this strong point and destroyed one pillbox with direct fire. But when the enemy concentrated intense and accurate machine-gun and small-arms fire against the vulnerable gun crew, this weapon withdrew. There was no suitable position from which the 37mm platoon could engage the hostile emplacements, and tanks were not available, so the infantry resorted to the slow methodical reduction of position after position by assault-demolition teams. In the afternoon Company C, on the left, ran into a similar fortified area. In this part of the battalion zone terrain allowed limited tank operations, and a request went back for armored support. Two and one-half hours later Shermans from Company B, with one flame tank from Company C attached, arrived on the scene. The flame thrower received a disabling mortar hit before it could get into action, but the other tanks provided effective aid. After giving enemy positions a thorough pounding, these machine led infantry into the pocket, knocking out several more pillboxes and a dug-in Japanese medium tank. With this armor support Company C regained its lost momentum and pushed on another 200 yards before 1915, when reduced visibility halted tank operations. Meanwhile, Company A continued its advance in the face of mounting casualties. Its more rapid movement carried it ahead of adjacent units, and at 1500 the reserve company moved up as a relief and began to consolidate positions, waiting for Company C to come abreast. Overlooking the west coast, 2/27 attacked at K-Hour with Company D moving north in contact with the 1st Battalion, and the other two companies driving northwest to fill the battalion zone of action where the island bulged out to the west. In this sector Marines had to fight their way through inland western beach defenses consisting of covered emplacements and caves. Here, too, the terrain and enemy mine fields restricted use of tanks. Gains were slow but steady, and by 1700 the left flank of the regiment had covered 500 yards. 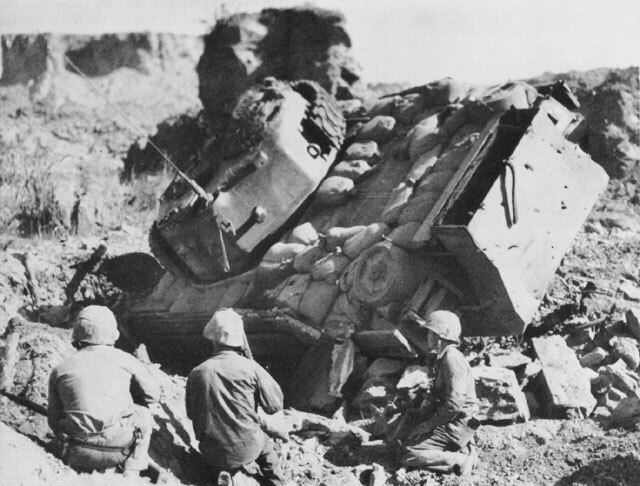 THIS SHERMAN (M4A3) TANK is stalled in Japanese pillbox that crushed as tank rolled over it. Infantrymen stand by waiting for salvage crew to retrieve the vehicle. 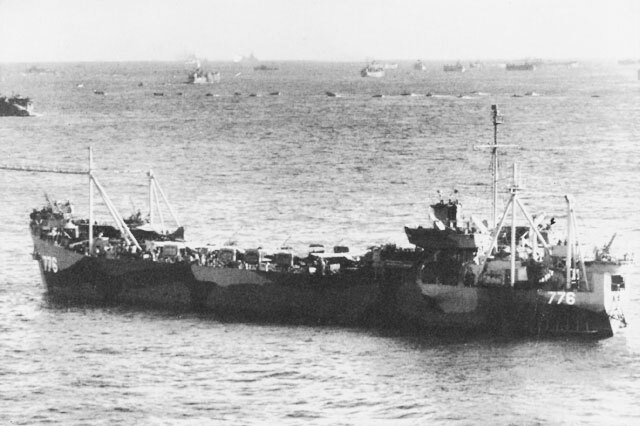 flown by the commanding officer of that unit, was launched successfully from the Brodie-equipped LST 7768 and landed on the island that afternoon. The second plane was lost overboard before it could be engaged in the launching gear, but after installation of an improvised safety device on D-plus-10 a third VMO-5 plane and two 4th Division OY's were successfully launched and set down on Iwo. LITTER BEARERS braved enemy fire to carry wounded to aid stations. Hill 362A rose sheer and naked above the contorted, rocky terrain ahead as RCT 27 moved out at 0815 on D-plus-9. This formidable looking mass lay squarely in the path of the 3d Battalion, on the right of the 5th Division zone. 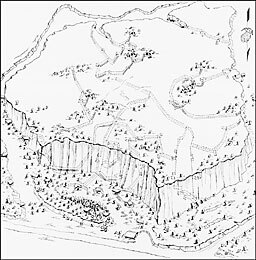 In the center and left, 1/27 and 1/26, which had relieved 2/27, continued to attack up a slope toward the ridge that led from the ragged edge of the northern plateau to the terraces above the western beaches. In the center and on the right the 1st and 3d Battalions of the 27th Marines battled slowly ahead in the face of the most intense small-arms fire they had yet encountered. The 1st Battalion, which had benefited from armored support on the preceding day, again employed tanks with success as it pushed through the highly organized mutually supporting positions of the cross-island defenses. About noon tanks of Company C ran out of ammunition, and Shermans from Company B came forward to continue the attack. Time after time the assault bogged down; then, with infantrymen guiding and designating targets, the tanks forged ahead, blasting bunkers into temporary silence, followed by assault teams that hurried forward to finish the job. 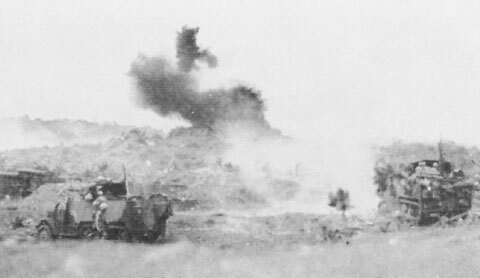 During one of these attacks, grenade-throwing Japanese soldiers rushed one of the tanks. Trying to back away from the greenish irritant smoke discharged by these missiles, the vehicle ran into a hole and threw a track. The crew was evacuated safely in another tank, but their disabled Sherman remained abandoned until a later day. The battalion commander committed his reserve (Company A) to pass through Company C in the left of 1/27's zone at 1630. Perhaps by design, but more likely by coincidence, a Japanese counterattack hit that portion of the Marine lines just as this relief was being accomplished. The attack was not in force, however, and Company A beat off the enemy without any loss of ground. This unit then tried to fight its way forward to tie in for the night with Company B, about 150 yards ahead on the right. This effort proved unsuccessful, and the battalion commander finally ordered Company B to pull back to establish a continuous battalion front. yards to regain contact with 1/27, lost because a small pocket held up the 1st Battalion's right. Company H then pulled back its right flank about 100 yards to make contact with RCT 21, which had replaced RCT 9 on the left of the 3d Division zone of action. Positions held by RCT 27 during the night of 28 February/March 1 were 300 yards ahead of the morning line of departure along a front that ran almost due east and west, passing just south of 362A. While Colonel Wornham's 27th Marines carried the attack northward, the 26th Marines (less 1/26 attached to RCT 27) made some progress in the salvage and replacement of weapons, and tried to rest and relax as much as possible while in reserve. At 0945 the 2d Battalion was also attached to the 27th Marines, but saw no action until the end of the day when Company F went forward to reinforce the lines of 3/27. The 28th Marines, in corps reserve since 25 February, was alerted on the 28th for a move to the north. During the afternoon the 2d Battalion, 27th Marines, relieved 2/28 of its patrol and defense responsibilities around Suribachi, and all battalions of RCT 28 moved north to assembly areas while Colonel Liversedge and his commanders reconnoitered routes forward to the front lines. MARINE TRUCK-MOUNTED 4.5-INCH ROCKET LAUNCHERS in action. After completing the mission these trucks will change position quickly to escape enemy retaliation. ADVANCING OVER A RIDGE LINE Marines look for trouble. The Japanese on Iwo conducted vigorous reverse-slope defenses and covered all ridges with mortar fire. During this bombardment, at 0215, the 4th Division ammunition dump was hit and burned fiercely until about 0700 when men of Headquarters and Service Battery of the 13th Marines and bulldozer operators of the 5th Engineer Battalion brought the blaze under control. At least 20 percent of the division's supply of small-arms ammunition was lost, along with corresponding amounts of heavier projectiles. the day before, and all units gained their first goal quickly. But as they advanced over the crest heavy machine-gun and mortar fire from the next ridge (Nishi) to the North forced them to take cover. Ahead of the center and right battalions the ground fell away sharply into a rocky draw, the sides and bottom of which were covered by fire from small arms, automatic weapons, and well zeroed-in mortars. 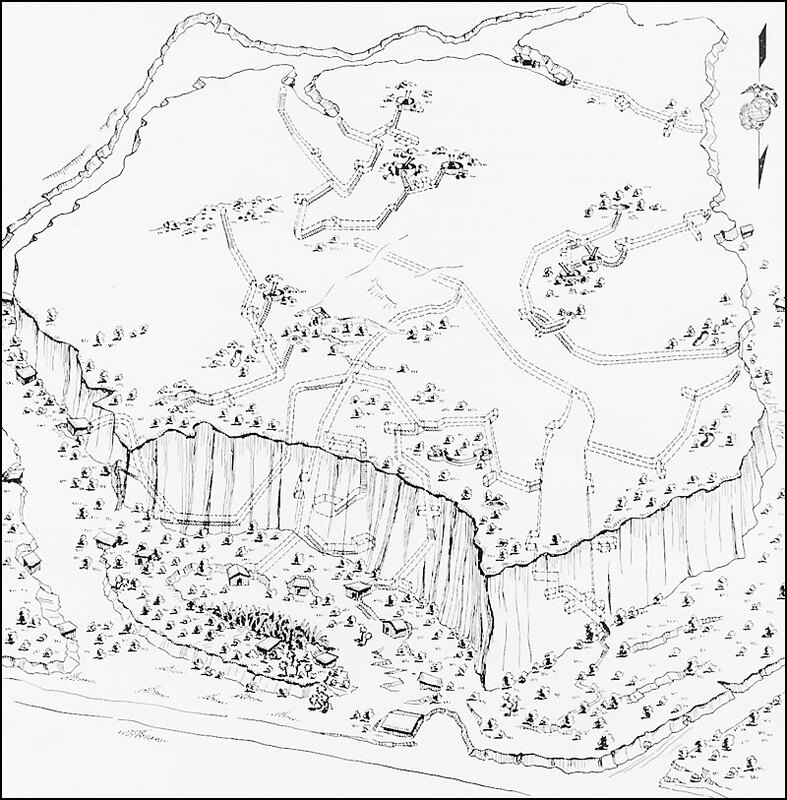 It soon became evident that breaking through the defenses ahead would be more difficult for the 28th than the short assault to seize the hill and its supporting ridges. Beyond the draw the ground leveled off for about 200 yards, then rose abruptly to form ragged Nishi Ridge. ADVANCING TOWARD NISHI RIDGE Marines move out behind tanks. Hill 362A breaks skyline at far right. right flank out ahead of the stalled unit on 2/28's left, a halt became necessary. While the 5th Division battled slowly through the network of strong positions around Hill 362A, the 3d Division broke out of the Japanese cross-island defense system in the center and struck rapidly to the northeast. Anticipating the development of a gap between his center and left divisions if the 5th did not move out quickly along the boundary to the north and east of 362A, General Schmidt, on 2 March, ordered General Rockey to make his main effort on the right, maintaining contact with the 3d. 155MM HOWITZERS were the heaviest artillery available to Marines at Iwo. In general support of the corps, these weapons fired a total of 43,795 rounds. Most of this ammunition was expended in counterbattery and preparatory fire missions. Plateau included within the division zone. While operating on this short front the 26th Marines could move more rapidly than the 28th, which held a 1,200-yard line, and could commit reserve units to maintain contact with the division on the right. 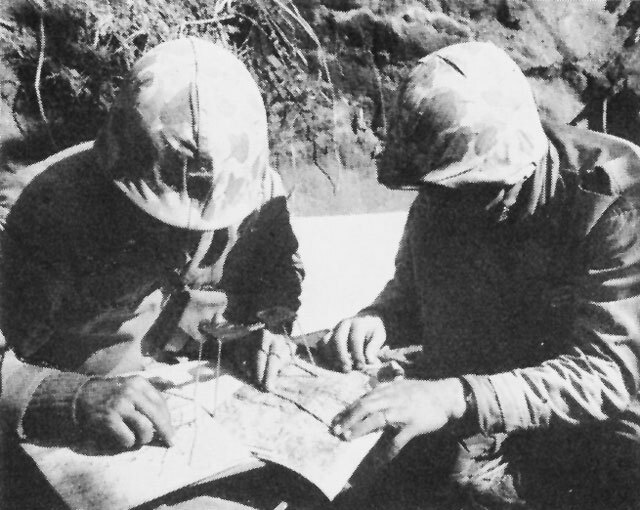 With only the 1st Battalion, 27th Marines as division reserve (2/27 was in corps reserve and 3/27 attached to RCT 28), Rockey also included the following somewhat unusual paragraph in his operation order for 2 March: "A unit creating a gap by advancing will be responsible for filling that gap. "26 This was certainly not intended to slow a coordinated advance by all units, but warned that the division commander had no troops available for plugging holes along his front. 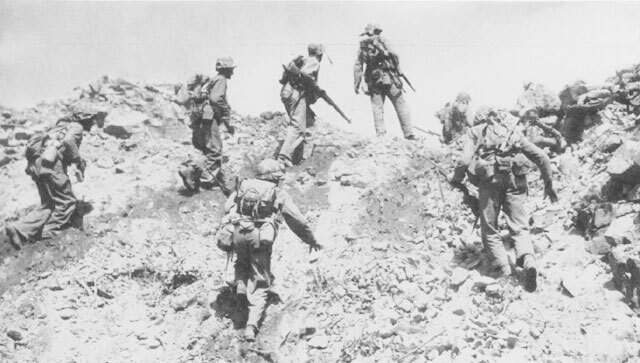 The 26th Marines jumped off along the division boundary at 0800 with 3/26 in the assault. As the battalion advanced, a gap opened on the left, and Companies D and F of the 2d Battalion fought forward to regain contact with 1/28 and fill the hole. Slowly Marines gained against the resolute Japanese defense. In this area the enemy depended more on positions cleverly concealed in the numerous crevices and outcroppings scattered throughout the rocky ground than on concrete emplacements, but the natural tank obstacles were extended and strengthened with mines. Kuribayashi's soldiers also crowded the Marine lines, thus further limiting the use of heavy weapons in close support. Although use of armor would be difficult, 3/26 requested and received Company A tanks to spearhead the attack. The two companies of the 2d Battalion were heavily engaged when the battalion received orders to shift to the right flank to close a new gap that had developed between RCT 26 and the 3d Division (21st Marines). Company E, in battalion reserve, moved out immediately (1400), but D and F had to disengage under heavy fire before they could join the rest of their unit. Lack of information concerning the particular unit of RCT 21 with which contact was to be made further complicated execution of this mission. Mine fields and mortar fire harassed the companies during the shift, but exhausted Marines finally closed the gap just as night fell. 75MM HALF-TRACKS stand by as demolition team blasts enemy pillbox. 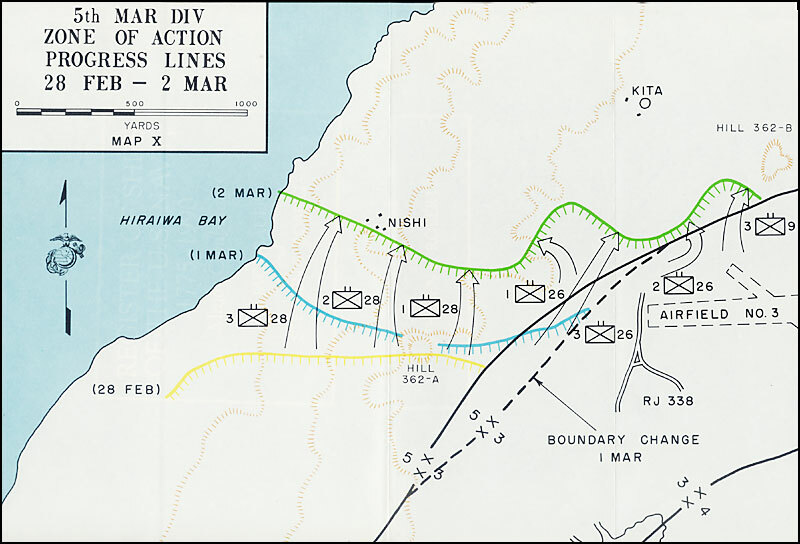 The 28th Marines, in the left of the division zone of action, jumped off on time with its three battalions in the same positions as on 1 March. The scheme of maneuver called for 1/28 and 2/28 to attack around both sides of Hill 362A and join on the north side for a coordinated assault to the first objective: Nishi Ridge. 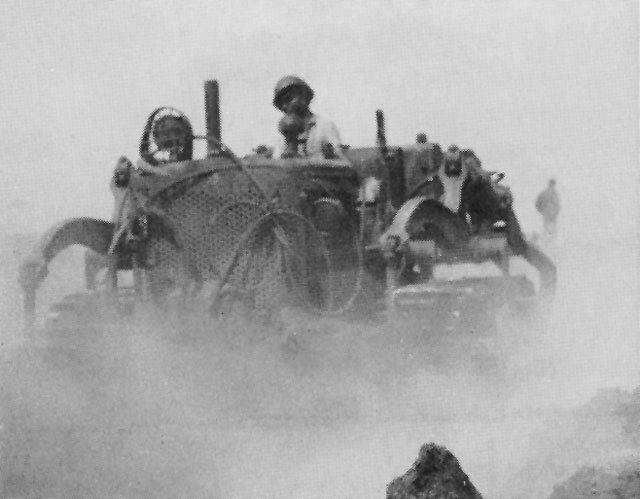 BULLDOZER OPERATORS pushed roads to the front. Sulfur fumes add ghostly appearance to this scene. This elevation, 200 yards to the north, ran west from the plateau almost to the water's edge, directly across the front. Just beyond it lay what had once been the little cluster of buildings called Nishi. The 3d Battalion would continue up the west coast on 2/28's left flank. When the 1st and 2d Battalions started forward, they met the same determined resistance as on the day before. Every time Marines moved down into the compartment that crossed the front, they received intense fire from both front and rear. Shermans' from Company B, 5th Tank Battalion, spent the entire morning trying to maneuver into effective supporting positions, but a long antitank ditch running north from Hill 362A interfered with these efforts. 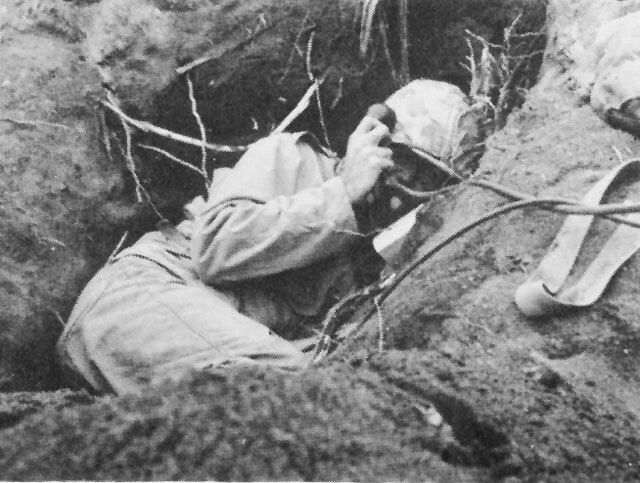 The 13th Marines concentrated on Japanese mortar positions throughout the day, firing both air-spot and forward observer missions with telling effect. But against close-in enemy targets the artillery was useless, so all infantry weapons had to be exploited to the fullest extent. Men from the regimental weapons company managed to set up three .50-caliber machine guns to cover caves that honeycombed the north face of the hill, and friendly mortars blanketed the area ahead. Company C tanks came forward at 1400 to relieve those of Company B, which had used up all their ammunition. On the way to the front one platoon of regular mediums and a flame tank blasted and burned hostile positions at the base of Hill 362A that still harassed advancing infantry from the rear. For the rest of the day this company provided a base of fire from stationary positions into the rugged cave-ridden sides of Nishi Ridge. TANKDOZER clears route through rocky defile. Terrain such as this limited tank operations and dozers became an integral part of any tank-infantry team. difficult to work with, and the 5th Engineer Battalion supplied the division intelligence officer with a total of 6,054 vectograph transparencies of the island for distribution to division staff sections and lower echelons. These vectographs,36 when used with a special but simple viewer, provided even small unit commanders with an easy means of determining ground contours. In this way, front line observations could be correlated with the terrain as indicated on maps, charts, and photographs of the area. Division operations orders and fire support plans were prepared from a mosaic of vectographs prepared by the intelligence section. The 5th Division resumed its attack at 0745 on 3 March with no change in formation. The 28th Marines was to attack north from positions along Nishi Ridge, while the 26th Marines, now up on the Motoyama Plateau, drove north from the division's right boundary and also pushed out northeast to relieve 3d Division units in the vicinity of Hill 362B. In its narrowing zone of action on the far left, the 3d Battalion, 28th Marines would hold up on the line of departure until the 2d Battalion pinched out Company G. Then Company I on the left was to move out in conjunction with the 2d Battalion. 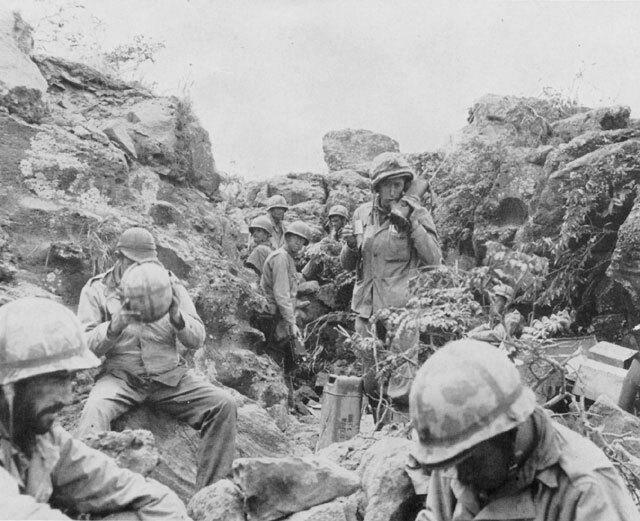 During the morning 3/28 received only light enemy fire as engineer-infantry teams continued mopping up and sealing bypassed caves along the coast. In the center of the regimental zone the 2d Battalion, supported by 75mm half-tracks, 37mm guns, and a reinforced platoon of tanks, encountered stiff resistance, and Company D, on the right, was halted shortly after 0800 by heavy mortar fire. As Company E advanced beyond stalled Company D, it was subjected to flanking fire from the right front and the tanks moved into that zone to engage enemy targets designated by the infantry. The action was at close quarters, and Marines frequently exchanged hand grenades with Japanese infantrymen. By 1000 the enemy to the immediate front had been annihilated, and the two assault companies, now reinforced by two platoons from Company F, got underway again. Along the boundary between RCT 26 and RCT 28, where the regimental fronts were almost at right angles to each other, 1/28 and 1/26 launched a coordinated attack to clear the enemy facing 1/28 and advance the 28th Marines' right flank to straighten the division line at that point. Casualties mounted fast as they drove through the maze of enemy emplacements hidden in the rugged terrain. Company H, 3/28, attached to 1/28 at daybreak, relieved Company B at 1100, but by 1230 this unit had taken such high casualties that Company B had to move back into the lines. In coordination with 1/26's attack, Company C on 1/28's right flank was successful in overcoming the enemy to its front and rolled forward 500 yards. Companies A and B on the left were unable to keep up, however, and the remnants of Company H were committed late in the day to fill the hole created by this uneven progress. Actually this company was so depleted that it could only cover the gap by fire, but the night passed quietly with no serious consequence. WAR DOGS and their handlers stood sentry duty, manned outposts, and accompanied patrols. If an enemy lurks in this cave dog will signal. Gains by the 3d Battalion were not so great as those of the 2d, but by the end of the day the dip in the lines had been completely eradicated and the flanks advanced some 200 yards. While the rest of the regiment fought its way northward, Companies D and E launched an attack to the northeast along the boundary to seize Hill 362B and relieve the 3d Battalion, 9th Marines, in the 5th Division zone of action. By 1430 the two companies of 2/26 had gained positions southwest of the hill and completed the relief of 3/9. SMALL-UNIT COMMAND POST just behind the lines. Marine standing at center is using SCR 536 radio. Rugged terrain provides excellent protection from all enemy weapons except mortars and grenades. and pillboxes along the southern and western slopes. Both company commanders (WIA) were among the heavy losses taken in reaching the summit of 362B. RCT 28 spent a quiet night, marked only by sporadic mortar fire and minor attempts at infiltration, but an aggressive enemy crowded the 26th Marines throughout the hours of darkness. During the night men of that regiment killed 97 out of an estimated 100 enemy would-be infiltraters in front of the lines. The weather on 4 March was warm (75°), but low-hanging clouds reduced visibility and intermittent showers dampened the spirits as well as the bodies of exhausted troops. An artillery preparation and a rocket barrage42 preceded the 0730 jump-off, but an air strike scheduled in front of the 5th Division was canceled because of the low ceiling. Attempts to use 75mm half-tracks and 37mm guns of the weapons companies were hampered by the terrain and the vulnerability of gun crews to enemy fire. Tanks provided excellent support, however, particularly the flame tanks, and limited gains made during the day resulted from the coordinated efforts of infantry-tank-engineer teams. In the center of the division zone of action 3/27 passed through RCT 28's right unit (1/28), and by 1800 had also relieved 1/26, which had been operating on RCT 26's left flank. After the passage of lines 1/28 moved south to replace 2/27 in corps reserve. At the eastern end of the line 1/27, now attached to the 26th Marines, took over a 1-company front, relieving the right flank unit of 2/26. Although the division made only minor gains, the fighting on D-plus 13 was bitter and costly, and units were shifted from company to company, and often between battalions, to strengthen the weakened units, most of which were operating at half strength. Headquarters personnel and men from weapons units were sent forward to bolster the rifle companies. To implement this order General Rockey directed RCT 26 to relieve 1/27 with 1/26, and ordered RCT 27, in reserve, to take control of 1/27 and prepare to launch a coordinated attack on the right of the division zone of action. He further directed that RCT 28 have 3/28, operating on a narrow front, expand to take over 2/28's zone of action.46 This reorganization would leave the division with the 28th Marines holding a two battalion front (3/28 left, 3/27 right), the 26th Marines drawn up with three battalions abreast, (3/26, 2/26, 1/26), and the 27th Marines (less 3/27) available in compliance with the corps order. On 5 March RCT 26 and RCT 28 made only local attacks to straighten the lines, and by 1200 the reorganization was completed. Marine artillery and naval gunfire were active throughout the day, and carrier planes flew 18 missions against enemy positions in the northern part of the island. 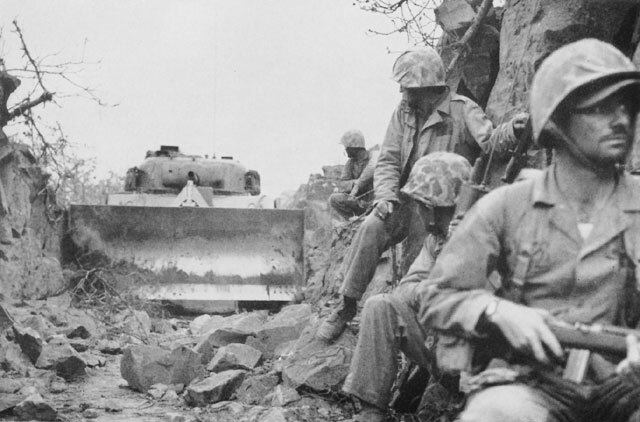 The tankers spent most of their time in bivouac areas performing sorely needed maintenance work, but a few Shermans operated in the 26th Marines area, reducing caves and strong points in the vicinity of the front lines. During this limited action one flame tank was disabled by a mine, and one regular tank lost to antitank fire. At the end of the day the 5th Tank Battalion reported 35 machines operational, including three flame throwers. were not silenced until the next day, slowed movement of supplies and knocked out several vehicles. When relieved by the 1st Battalion, 26th, 1/27 began moving to an assembly area just west of RJ 338, along the division boundary. During this movement, Lieutenant Colonel John A. Butler, the commanding officer, was killed at the road junction when a high-velocity shell hit his jeep. That afternoon Lieutenant Colonel Justin G. Duryea, operations officer of RCT 27, assumed command of 1/27. At 1500, 2/27 moved to an assembly area just north of 1/27, from which it would pass through 1/26 on the division's right flank at daylight. K-Hour was 0800. At 0750, 6 March, three battalions of the 13th Marines joined eight other battalions of artillery to fire a smashing, 2-phase preparation for the corps' echeloned, main-effort attack toward the northeast coast.48 In support of the first phase, a coordinated K-Hour attack to the northeast by RCT's 27 and 21, the massed artillery delivered a 10-minute preparation at a rate of five rounds per gun per minute, followed by a rolling barrage that lifted approximately 100 yards every seven minutes for 21 minutes. The rate of fire for the barrage was two rounds per gun per minute. The 2d Battalion, 27th Marines started forward at 0500 under cover of darkness and moved to positions just behind 1/26. The actual relief, which began at daylight, was completed by 0730, and the troops were ready to move out as soon as the preparation lifted. But just as the assault was to begin, enemy shells landed in the area of Company E (2/27), on the right, causing 35 casualties and delaying the jump-off for about ten minutes. Company E made little gain and Company F, on the left, advanced only very slowly against strong Japanese positions consisting of pillboxes and the ever-present caves. One platoon of the reserve company was committed on the left and moved out a short distance, but 2/27 did not make any significant advance on its first day of action in the indescribably rugged northern section of Iwo. From K-plus 45 minutes to K-plus 81 minutes the 1st, 2d, and 3d Battalions of the 13th Marines shifted their fires to support the second (K-plus 60 minutes) attack launched by the 3d and 4th Divisions. Upon completion of this mission for the corps, 1/13 reverted to a general support role for the 5th Division while 2/13 and 3/13 fired in direct support of RCT's 28 and 26 respectively. The 4th Battalion supported RCT 27 in the division main effort attack throughout the day. In the 26th's zone of action, the 1st Battalion, which had just been relieved by 2/27, moved to the left and replaced 2/26 in the line. Then at 1245, following an artillery preparation, 1/26 launched an attack. The 3d Battalion, still operating on the left of the regimental front, was to move forward as soon as 1/26 had reduced a strong point that enfiladed its lines. Repeated attempts to break through this resistance failed, however, and neither battalion made an important advance. On the far left of the division front, RCT 28 maintained generally the same positions throughout the day. 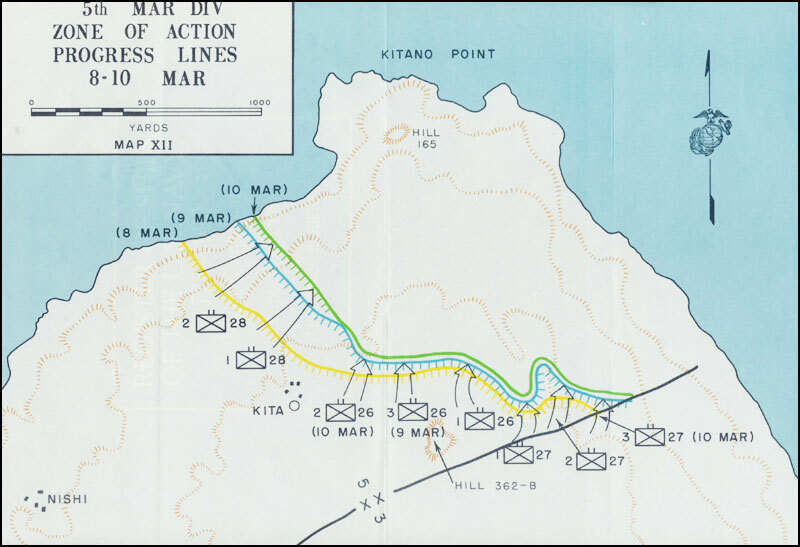 The 3d Battalion, 27th Marines (attached to RCT 28) advanced slightly when 3/26 on its right moved ahead a short distance, and 3/28 kept pace along the coast, but no major changes occurred. The corps operation order for 7 March again directed the 5th Division to make its main effort in the northeast sector of the division zone of action with the high ground overlooking the sea as the objective.54 General Rockey's order to his three infantry regiments reflected the corps' scheme of maneuver, directing RCT's 26 and 28 to make ". . . minor objective attacks . . ."55 and RCT 27 to make the main effort in its zone. K-Hour was 0730, but at 0640, in the presunrise twilight, Colonel Graham's 26th Marines (less 2/26 in corps reserve) jumped off without preparatory fires in a surprise attack to reduce the strong enemy pocket that had blocked the advance on the previous day (6 March). grenades, and short range rifle fire exacted an exorbitant toll in killed and wounded for a meager gain of 150 yards. Attempts were made to bring up tanks in support, but the terrain proved impassable. About noon one platoon from Company C plugged a gap on the left between RCT 26 and RCT 27. When this platoon advanced ahead of units on either side, it immediately received vicious flanking fire. Grenades and 81mm mortar smoke shells were fired to screen this small unit as it withdrew to a more sheltered line, and at 1330 a second platoon from the same company moved into the line to maintain contact with RCT 26. During the afternoon the grim cave warfare continued but with scant gain. 5TH DIVISION OFFICERS study stereo pairs to orient themselves in the jumbled terrain. For the first time since the beginning of the operation the corps order for the attack on 8 March departed from phase-line objectives and directed the divisions ". . . to capture the remainder of the island. "59 The 5th Division was to continue its main effort on the right, with RCT 27 driving to the northeast coast along the division boundary, parallel to the 3d Division advance. The 2d Battalion, 27th Marines, commenced its attack at K-Hour (0750) but made little progress until tanks arrived. The Shermans had set out from their bivouac area as soon as there was enough light to travel, moving along a route reconnoitered the day before. The rough terrain hampered their progress, and it was not until about 0900 that armor of Company B arrived in position to support the assault. With this aid, Company E finally managed to inch forward through the heavily mined and cave-infested area to the front, grinding out an advance of about 150 yards during the morning. In the left of the battalion zone, where the ground was too rough for employment of tanks, a 15-man crew from Battery B, 13th Marines, wrestled a 75mm pack howitzer and 200 rounds of ammunition up close to the front to provide essential direct fire support. This weapon destroyed several enemy positions, but Japanese resistance in front of Companies D and F remained virtually undiminished and only very limited gains were made. Although the attack by RCT 28 on the division's left flank was delayed somewhat while the 1st and 2d Battalions passed through 3/27 and 3/28, gains during the day were good. Along the coast 2/28 equalled the 500-yard advance of the previous day, and on that unit's right 1/28 moved ahead 300 yards. Both battalions jumped off against light opposition and scrambled forward rapidly over the rough ground for at least 100 yards before any serious enemy reaction developed. Then Japanese fire increased along the front, and bypassed positions came to life to harass the rear of assault elements. 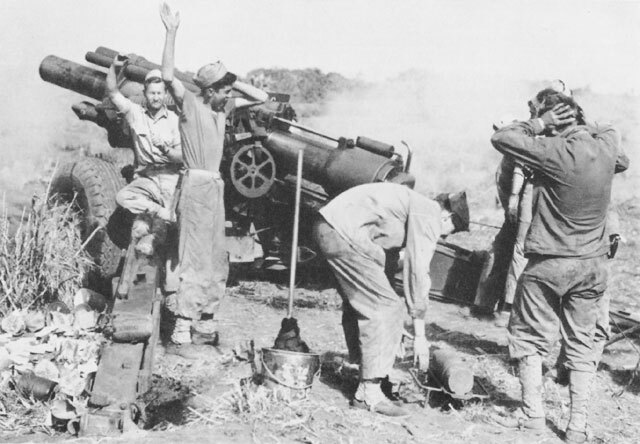 The attached 75's and 37's of the weapons company were pressed into service, and 81mm mortars fired heavy concentrations in an attempt to neutralize Japanese weapons. Naval gunfire pounded coastal areas ahead of the advance and planes struck twice at Hill 165, one of the last significant terrain features in the regiment's zone of action. As enemy resistance stiffened, the infantry requested armor, and 11 regular plus two flame tanks were dispatched to the front. But the only available route forward was heavily mined, and engineer clearance teams were pinned down most of the day by rifle fire with the result that only four rounds of 75mm ammunition and half a load of flame oil were expended in support of the 28th Marines on D-plus-17. came under intense and accurate fire from high ground that ran southeast from Kitano Point. Slowed by this fire, the drive to the northeast finally came to an abrupt halt against a long, low ridge line that overlooked a deep gorge. In this steep draw the Japanese held out 15 more days to create the final pocket of resistance on Iwo. Early in the morning of 10 March 2/26 completed relieving elements of 3/26 (Company G) and the 26th Marines attacked at 0800 for no gain. A second attack at 1400 netted only 75 yards. The plan for D-plus-19 had called for 2/26 to advance diagonally (northeastward) across the front of the 1st Battalion and pinch out that unit, leaving only the 2d Battalion on line. The day's small gain did not allow execution of this plan, and at 2000 1/26 and its zone passed to control of RCT 27, on the division right flank. The 3d Battalion became corps reserve at about noon, the 10th of March. In early afternoon the hazard of land mines was forcibly demonstrated when an explosion seriously wounded Lieutenant Colonel Justin G. Duryea, commanding 1/27, and Lieutenant Colonel John W. Antonelli, commanding officer of 2/27. They had met near the front lines with other officers to confer on the situation. The company commander and another officer from Company E, and the intelligence officer of 2/27 were also wounded by this blast. Both battalion commanders and the company commander were evacuated, but the other two officers continued in action. Command of the 1st and 2d Battalions passed to the executive officers, Major William H. Tumbleston and Major Gerald F. Russell, respectively. 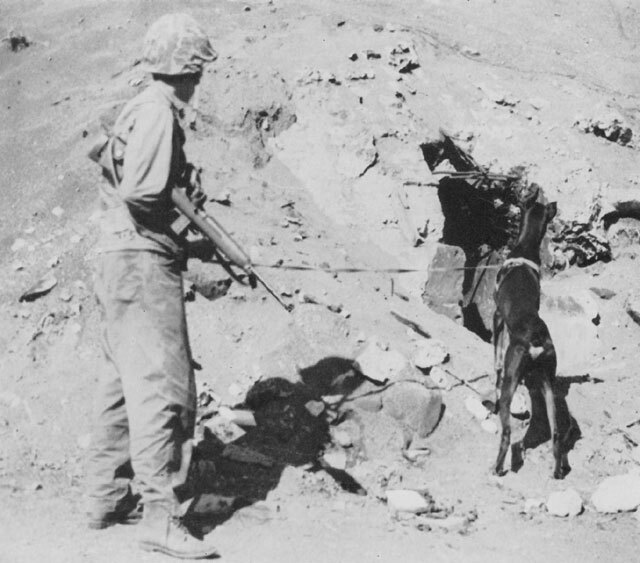 The 13th Marines fired preparations and scheduled supporting fires for the attacks on these two days, but its contribution was not limited to this normal function. About noon on 9 March General Rockey ordered his artillery regiment to have ten percent of its personnel stand by on 1-hour notice as infantry replacements. The next day a detail from Headquarters and Service Battery and the 1st and 3d Battalions reported to the 28th Marines, and men from the other two artillery battalions reported to the 26th Marines. 1. Unless otherwise cited, material in this chapter is based on the following: 5th MarDiv SAR; 26th Mar SAR; 27th Mar SAR; 28th Mar SAR; 13th Mar SAR; 5th MarDiv War Diaries, Feb-Mar45. 2. The 13th Marines had also recommended the occupation of these two tiny islets to give United States forces observation posts from which a large portion of the northern part of the island could be seen, and also as a site for sound and flash ranging stations. 13th Mar SAR, 34, 35. 3. Ibid., 13. 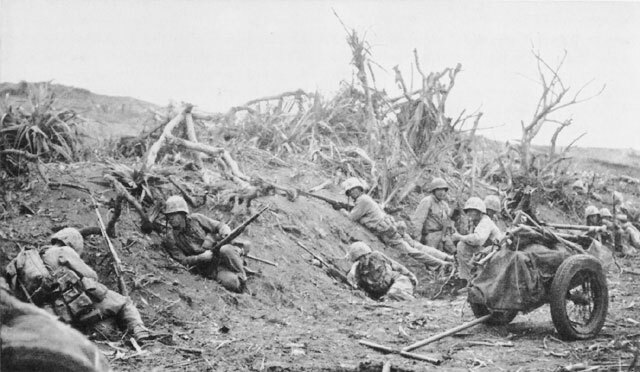 Only three battalions were available for this mission as 4/13 had been assigned to reinforce the fires of the 12th Marines. The three battalions fired 584 rounds on this choice target. 5. 26th Mar SAR, Appendix 4, 7. 6. 5th MarDiv SAR, Annex M, 12, 15. Since these LVT(A)'s had no gyrostabilizer to steady the gun tube, firing from water-borne positions on a choppy sea was extremely difficult. 7. 5th MarDiv SAR, Sec VII, 22; 13th Mar SAR, 40. 8. This LST was equipped with booms and cables, called a Brodie device, for launching and recovery of light planes. CominCh P-0012, 3-3. 9. 5th MarDiv SAR, Annex G, Appendix 2, 1. 10. Ibid., Appendix 1, 5. 11. It is of interest to note that as of 1800, 27Feb, the corps reported enemy dead as 5,483. Of course this figure was only an estimate as it could not accurately account for the large number of Japanese sealed in caves. C-2 Periodic Rpt, 27Feb45. 12. VAC IntelRpt, Encl A, "VAC Preliminary Order of Battle, Iwo Jima," 27Feb45. 13. 5th MarDiv IntelRpt, 39; 5th MarDiv SAR, Annex H, 7; TF 51 Rpt, Pt V, C, 13. 14. Bn 2/26 established four listening posts along the beach the night of 28Feb/1Mar to assist in night defense measures. One dog from the 6th War Dog Platoon and a small fire group of Marines were stationed at each post. These elements reported that the only resistance met during the night came from the watch(?) dogs who were kept awake only with great difficulty and constant prodding. 20th Mar SAR, Appendix 4, 9. 16. This was a friendly 105mm howitzer shell, thrown out from the burning ammunition. Fortunately, this missile did not explode with great force in the FDC. Outside of causing the fire, it did little damage. Ltr BrigGen J.S. Letcher (Ret) to CMC, 13Mar53. 18. At 0238 an air-raid alert was passed, and at 0300 further excitement was added when exploding white phosphorous shells caused someone to sound the gas alarm. This mistake was quickly corrected, however, and the gas alert cancelled at 0310. No enemy planes approached the island, and the "all clear" was given at 0430. VAC OpRpt, 28. 19. The 5th Div now had the use of all four battalions of the 13th Marines, 4/13 having been released from its supporting role with the 12th Marines at 1600, 28Feb45. 13th Mar SAR, 15. 20. In this connection the following message from VAC to all divisions is of interest: "In order to effect coordination and to employ available fire power more effectively during King Hour preparations no air strike will be conducted during the period King-minus 45 to King-plus 15 within the zone in which artillery and naval gunfire are shooting." Disp VAC to 3d, 4th, 5th, Divs, 1412, 1Mar45. 21. TF 51 Rpt, Pt 111, 16; TF 54 OpRpt, 20. 22. 5th TkBn SAR, Encl C, 5. 23. As noted in Chapter VI. 24. Disp VAC to 5th and 3d Division, 1325, 1Mar45; 5th MarDiv Record of Telephone Conversations, 5th MarDiv to VAC, 1855, 1Mar45. 25. This was the second Hill 362 that lay at the north end of the plateau. 26. 5th MarDiv OpOrder 9-45, 1Mar45. 27. VAC OpOrder 10-45, 1Mar45. 28. 26th Mar SAR, 9. 29. 5th TkBn SAR, Encl B, 5. 30. 28th Mar R-3 Periodic Rpt No 12, 2Mar45. 31. 28th Mar SAR, Annex O, 18. 32. A report of this incident made by the R-3 (RCT 28) describes the gas as ". . . fairly dense and heavy enough that it went into foxholes. The gas seemed to dissipate quickly. Men did not wear gas masks and it did not affect men unless they were in immediate area of the shell burst. It is the opinion of personnel in [3/28] that the gas is probably picric acid." 28th Mar AR-3 hand written report, 3Mar45. 33. 28th Mar SAR, Annex O, 18. 34. As narrated in the preceding chapter, the 3d Division had received permission to seize Hill 362B, which was located in the 5th Division zone of action but threatened the flank of the advancing 3d. Although 3/9 reached the foot of Hill 362B on 2Mar, corps ordered 5th Division to relive 3d Division troops in the 5th's zone the following morning. 35. Two photographs of the same object or area taken from slightly different angle are called stereo pairs. By means of a special viewer the images of two such photos can be merged to make one picture clearly showing depth. 36. To make vectographs, transparencies from a stereo pair are polarized at right angles to each other and mounted together. Through another polarizing agent, the viewer, the right eye sees the top image only and the left eye the back image only. The effect is the same as normal three-dimensional vision with both eyes. Impact, Vol 1, No. 3, August 1943, 45, published by Office of the Assistant Chief of Air Staff, Intelligence. Washington, D.C.; 5th MarDiv IntelRpt, 9, 36, 37; Ltr LtCol G.A. Roll to CMC, 7Apr 53. 37. 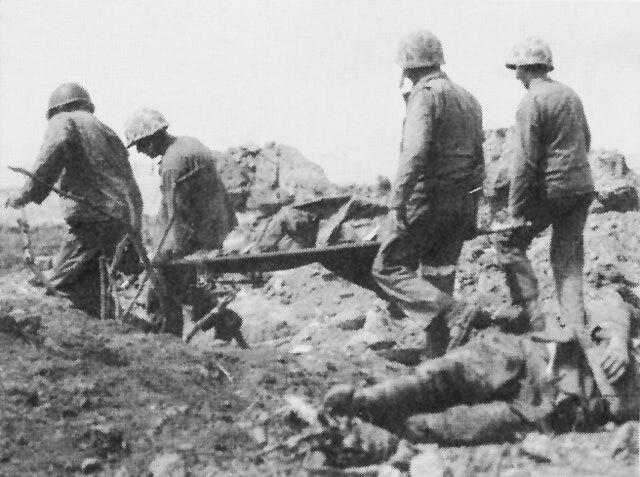 The 26th Marines (not including attachments) suffered 8 officer and 273 enlisted casualties on this date, 3Mar45. 26th Mar War Diary, Mar45. 38. 5th MarDiv IntelRpt, 26. 39. C-2 Periodic Rpt No. 14, 4Mar45. 40. 26th Mar SAR, 41. 41. 5th MarDiv SAR, Annex J, 24. 42. The sudden and intense concentration of these 4.5-inch barrage rockets, fired from Mk-7 rocket launchers, made this weapon ideal for last-minute preparations. It was often used as a signal for the jump-off in an attack. 44. Ibid., 37; 27th Mar SAR, Encl A, 5; 28th Mar SAR, 30, 51; 26th Mar War Diary, 4Mar45. 45. Disp VAC to 3d, 4th, 5th Divs, 1624 4Mar45. 46. Disp 5th MarDiv to organic units, 1945, 4Mar45. 47. As the best routes to the north lay in the 3d Div zone of action, the flanking divisions frequently moved troops and equipment through the center to their fighting fronts. Beginning on 2 March the Corps OpOrders specifically authorized this. VAC OpOrder 11-45, 2Mar45. 48. These roles of the 3d and 4th Divisions in this attack are related in Chapters VI and VIII respectively. 49. C-3 Periodic Rpt No 16, 6Mar45; TF 51 Rpt, Pt V, C, 32; VAC Air Rpt, Encl A. 50. Disp 5th MarDiv to VAC, 1425, 6Mar45. 51. VAC OpOrder 14-45, 6Mar45. 52. Disp VAC to division and corps artillery units, 1715, 5Mar45. This dispatch was dated 5 March but the VAC G-3 Journal shows it logged out at 1739, 6Mar45. 53. 13th Mar SAR, 17. 54. VAC OpOrder 14-45, 6Mar45. 55. 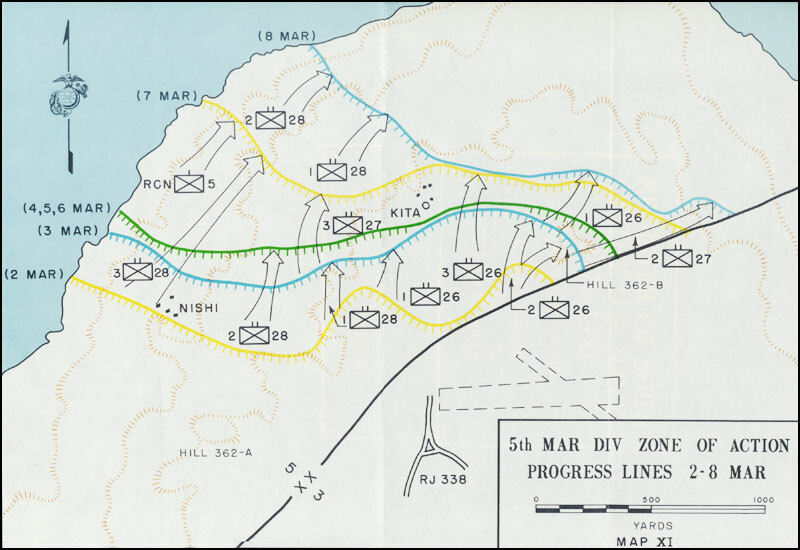 5th MarDiv OpOrder 13-45, 6Mar45. 56. SSgt Henry Giniger and SSgt Tony Smith, "The Twenty-Seventh Marines in Combat, Iwo Jima," manuscript, undated. Hereafter cited as Ginger and Smith. 57. 5th MarDiv D-3 Periodic Rpt No 17, 7Mar45. 58. VAC Air Rpt, Encl A, 5. Other ordnance dropped in these strikes included 67 500-lb bombs, 170 100-lb bombs, and 426 rockets. 59. VAC OpOrder, 15-45, 7Mar45. 60. Lieutenant Lummus was awarded the Medal of Honor for his dauntless leadership on 8 March. 61. 27th Mar SAR, Encl F, 13. In another report this attack was described as ". . . a terrific Marine drive . . . which at times assumed the proportions of an American banzai charge." Giniger and Smith, 18. 62. Horie, 9. Tamanayama refers to the area east of Airfield No. 2 in the 4th Division zone of action. The "Northern districts" fell in the 5th Division zone. 64. VAC Air Rpt, Encl A, 6. 65. Horie, 10. Tenzan was the area east and north of Hill 362B where RCT 27 was attacking. 66. C-2 Periodic Rpt No 20, 10Mar45. 67. Ibid. Broken down by divisions the number of POW's taken as of 10 March was: 3d MarDiv--49, 4th MarDiv--28, 5th MarDiv--34.